Roadside mailboxes should be positioned so that the mail carrier can safely reach inside without leaving their vehicle. Typically, this means positioning the mailbox 41″ to 45″ off the ground and 6″ to 8″ from the curb. Next turn your mailbox over and measure the length and width of the inside void. Cut your 1″ thick wood plank to the size of the void. This wooden plank will be used as a mounting board to fasten your mailbox to your post, so ensure that it fits into the underside void before moving on. Cut your 1″ thick wood plank to the size of the void. This wooden plank will be used as a mounting board to fasten your mailbox to your post. Make sure that it fits into the underside void before moving on. Finally fit the mailbox onto the mounting board and ensure that it is centered. Remember to open the door of the mailbox to check for any interference. 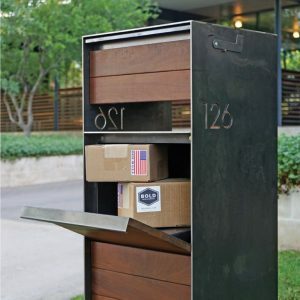 Once the mailbox is properly aligned on the mounting board, fasten the mailbox to the board by drilling wood screws through the mounting holes located on the sides of the mailbox. These easy steps will help you install your locking mailboxes.